20% Off Food with Loyalty Card at La Tasca Valid all week and all day when you show your loyalty card! 25% Student Discount at La Tasca Valid Monday to Friday from 4 pm to 7 pm! Tapas Y Vino - 6 Tapas & Bottle of Wine for £30 at La Tasca Valid Monday to Friday from 4 pm to 7 pm! After Work Drinks from £3 at La Tasca Valid Monday to Friday from 4 pm to 7 pm! 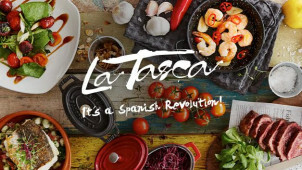 La Tasca is a fairly small restaurant chain with over 10 branches all over England, including at Lakeside shopping centre, the Trafford Centre in Manchester, Canary Wharf in London, and a number of high street locations including Bournemouth and Milton Keynes. The restaurant aims to bring authentic Spanish flavours to UK diners, and also a stylish yet rustic Mediterranean ambience through its décor. Perfect for a tapas meal, lunch or dinner, La Tasca is a casual restaurant where you can relax with friends and take your time over the selection of delicious Spanish dishes you've chosen, along with their excellent choice of drinks. You can get some great deals too, especially if you use vouchercloud offers when you dine. La Tasca also has some events at its restaurants, including music and special tastings, so if you love the food and atmosphere at your nearest La Tasca, it is a good idea to keep checking their website and follow them on social media! How do I use my La Tasca voucher? Join the La Tasca loyalty program by downloading their app, which is available for both Android and iOS. This entitles you to discounts every time you visit, as well as special deals on drinks and extras on your birthday. You can also join by picking up a card at your local La Tasca and registering it on their website. Can I book my table at La Tasca online? You don't always need to book at La Tasca, however, it can be a very good idea if you want to go at a busy time or have a big group with you. You can book online here. La Tasca has a whole section of its menu dedicated to vegetable tapas, and their paella is also available without meat and seafood. Some vegetarian options do include eggs and cheese, however, so if you are vegan look out for the vegan-friendly symbol on their menu next to items you can choose. Where is my nearest La Tasca? You can find the locations of all the La Tasca restaurants here. For the fiery, bold and exotic flavours of Spain - you can't go wrong with La Tasca. With a delicious selection of tapas as well as great main courses, starters and sides accompanied by Spanish wines and sangria, La Tasca offers an authentic Spanish dining experience. Dine out with a La Tasca voucher, and your Meditteranean meal is suddenly much more affordable. Psst.. their famous Paella is simply a must-eat! Many of the menu items at La Tasca are designed to be shared, and eaten in the traditional Spanish way. This means that if you want to try all kinds of different foods then ordering a selection of tapas and sampling it with the people you are with is a great way to go. You can also order big pans of La Tasca's famous paella, which is available with seafood, chicken and chorizo, all of the above, or just with vegetables as an option for vegetarian and vegan customers. If you prefer your own plate or are eating there on your own, however, there are also plenty of standalone dishes. If you want a drink with your meal, La Tasca has a fantastic choice of wines and cocktails, including an exceptional range of high quality gins. However, to really complete the Spanish experience why not opt for one of their refreshing sangrias? Available by the glass of by the pitcher, sangria is made from a mix of spirits that includes Spanish brandy and Liquor 43, along with rioja or cava (depending if you choose the red or sparkling versions) and fruit juices. Use one of our La Tasca offers in-store to dine for less on the day, or check out the online promotions to book in advance.